Going all the way back to September 1984 for this one. 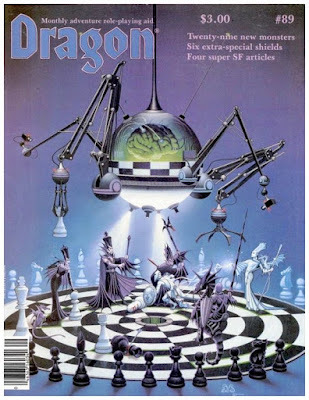 Highlights include that wonderful Denis Beauvais "Chess" cover, a follow-up to his Issue 86 cover. Like that issue, I have some pretty fond memories of this one. Put on some "Let's Go Crazy" by Prince and jump on into "This Old Dragon!" We start with a very interesting letter. The reader asks if print version of some Dragon covers could be sold. Editor Kim Mohan responds saying they can't because they do not own the reproduction rights to many of the covers. 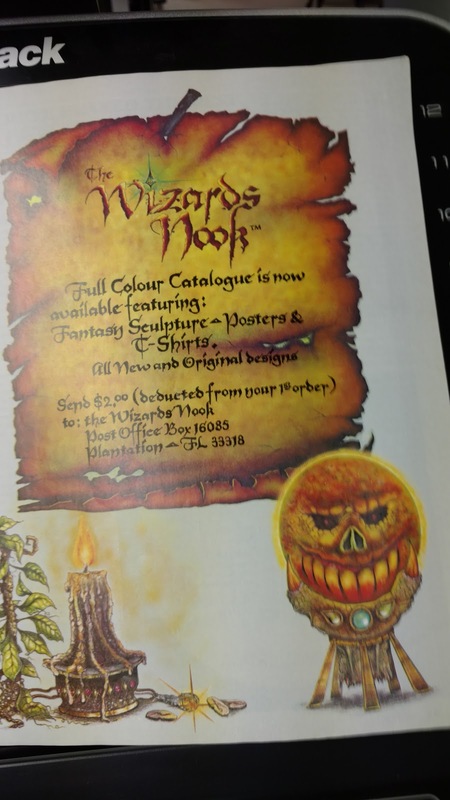 Now in later magazines, we know this changes a little due to the "Art of the Dragon" book that comes out, but others are still owned by their respective artists. Something they later seem to miss when publishing the CD-ROM. Stephen Inniss is back (or this could be his first) with Survival is a group effort. He talks about the survival chances of some of the frequently used humanoid races. I was surprised to see that he gave kobolds a really long life span. At five pages it is an interesting read. The aging tables are worthy of cutting out and sticking into your Monster Manual. Six very special shields is next and comes from the pen of Ed Greenwood via the word of mouth of Elminster. I remember having some high hopes for this article; that it would as interesting as the swords ones they (hypothetically) compare it too, but somehow it doesn't live up. I do recall putting Reptar's Wall into one of my games though. Cool ad for The Wizard's Nook. I had no idea what they sold really, never sent my two bucks in for a catalog. Len Lakofka returns for more Gods of the Suel pantheon. This time featuring Pyremius, Beltar, and Llerg. I was SO into the Suel back then. I collected all of these articles, I wrote a bunch of histories detailing the migration of the Suel survivors all over the world. Their histories and magic. It is interesting to see which of these gods survived to today. These gods made it to the 3.x Living Greyhawk Gaz and Complete Divine. The article Many Types of Magic by Charles Olson covers a particular 1e problem of well....somethings just not making much sense. 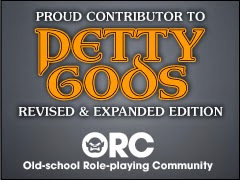 So anyone familiar with the history of D&D knows how it grew somewhat organically and that means things sometime feel off. The magical classification system (Alteration, Illusion, Conjuration...) doesn't always follow the rules. This is something addressed here, and to a much larger degree in 2nd and 3rd Edition. I can't tell if this article informed those changes; they were really must needed changes to start with. 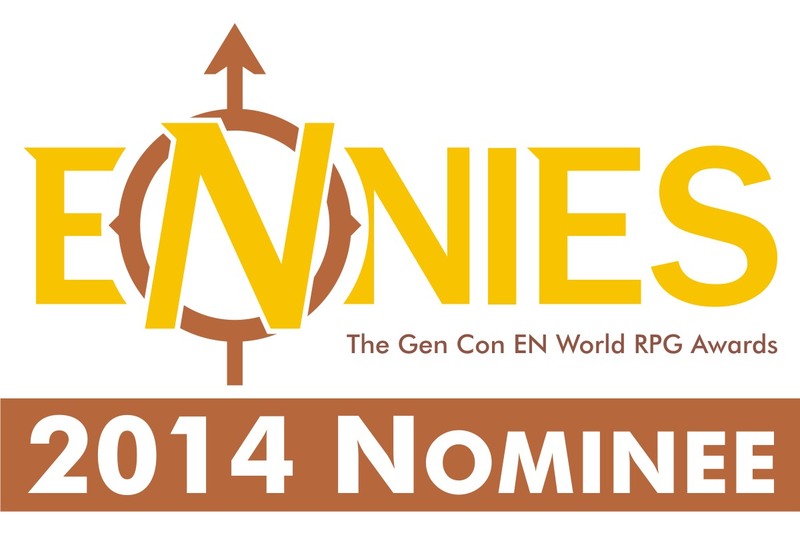 Now before the angry posts and emails start, I am not saying 1e is broken or anything like that. It does have its own set of peculiarities. Anyone who played it knows this. Another great ad for the Time-Life book series The Enchanted World! Show of hands. Who had these? Of COURSE I had the Witches and Wizards one. I also have the one on Ghosts. I see them at Half-Price Books a lot. I'd get more of them (just for the geek street-cred) but they are too tall for my bookshelves! In the annals of "useless NPC Classes" I think the Sentinel from Halt! Who goes there? would make the top of my list. Maybe only the accountant from the dawn of the Dragon is worse. It's not a bad class, it just doesn't really do anything a fighter with some thief skills couldn't do better. I am actually pretty sure a multi-classed fighter/thief would be better. Ah. Here we go. 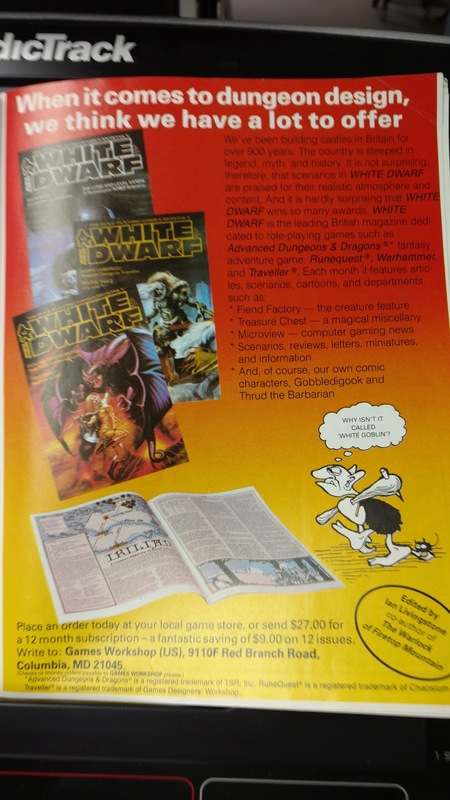 I am not sure if it was this issue or an earlier one, but it was this ad that got me interested in White Dwarf. Issue 44 was my first White Dwarf. Learn magic by the month by Craig Barrett covers learning new magic in the Dragonquest game. I have to admit I always liked the look of Dragonquest and wanted to learn how to play it. No one around me did at the time. I think I missed out on some cool experiences, to be honest with you. Rereading this article only convinces me of that. Trouble is I doubt I have the patience anymore to learn a relic from the 80s. Oh now, this was fun. My appetite for new monsters was strong 1984 and I always wanted something new to throw at players that had the Monster Manual and Fiend Folio memorized. This was a great addition. In particular, I enjoyed the Fachan (it was so weird), the Ghuuna (which I still use), the Glasspane Horror (one of my favorites), and the Utukku (I made a revised one years ago based on the same myths). I lost my original copy along with all my 2nd Ed material (I had put it in my Montrous Compendium binder), so it is great to have this one again. Roger Moore follows up with an article on calculating monster XP values. The Monster Manual II will also make this easier in the future. The Ares Sci-Fi section is next. Some articles on the Mega-Corporations of Star Frontiers. Continuing the articles on the Moon we have Luna, The Empire and the Stars for the Other Suns game. Of Grizzly Bears and Chimpanzees covers mutant animal characters in Gamma World. 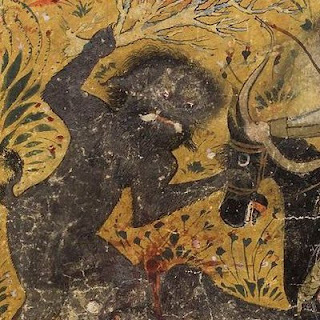 I used this article to beef up the Gorilla Bear that appeared in the Fiend Folio. Missing some pages. Checking the CD-ROM it appears that the Marvel Phile was cut out as was the crossword puzzle. We end with Wormy and Snarf and the answers to the crossword. A fun issue to be sure! Loved the cover and monsters. Want to know what I was saying about White Dwarf magazine during the same month? Check out my White Dwarf Wednesday for issue #57. Of the Dragon Mags I had as a child, this was perhaps my favorite. Aside from the cover (which was magnificent), I actually loved the magic shields AND the sentinel class (was always sad it wasn't a PC class). No, I never used it as a DM...nor any of the shields, nor any of the monsters. Which leads me to think that I acquired this issue at a time when I'd given up the DM's chair (I did for a year or so)...but I still spent long hours poring over its pages. The Gamma World animal stats DID get used for GW (which I ran), and I was grateful for them, though I think I'd appreciate them more even today. Man, I should dig this one out of the closet. Totally agree on the Wizard's Nook ad, BTW. I still have my Enchanted World books. My mom subscribed for me as a gift. You are totally correct about them being too tall for the bookshelves! Mine have to go on top shelf, which is open at the top, or I have to stack them flat/sideways. My dad subscribed to the Enchanted World for a while, and I acquired his from my mom a few years back. I've also acquired a couple more that I had never seen back then. The quality of the art and writing are both all over the place, and it's nigh impossible to find that one specific thing you know you saw years ago but don't recall where, but there are some really nice bits buried in there. The Vasilisa/Baba Yaga story in the Witches book was one of the highlights of the series, both in content and art. And the utbird (from Ghosts) inspired one of my first APA articles, back in my 20s. "The aging tables are worthy of cutting out and sticking into your Monster Manual." Just a minor correction - Fading Suns hadn't even been conceived at the time of Dragon #89's publication. I think you mean Other Suns. we did not get this one (but I loved the cover art)...!!! Can you adjust your bookshelves? 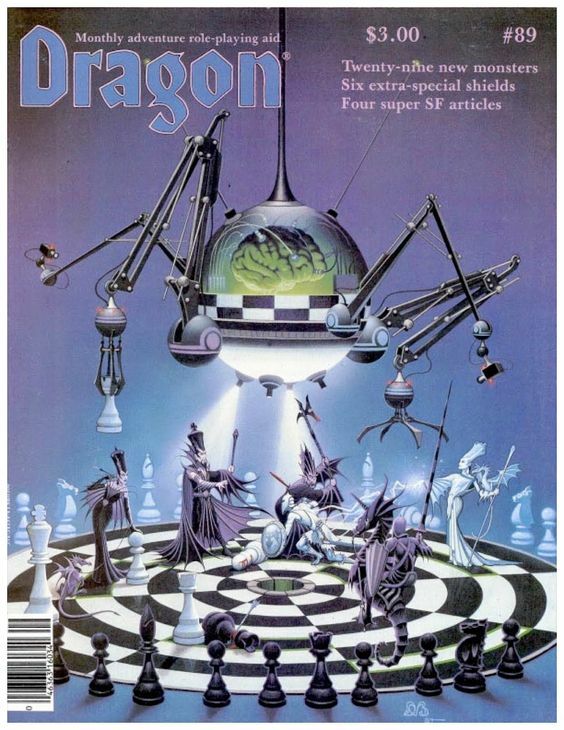 That's in my top 10 covers of Dragon Magazine! 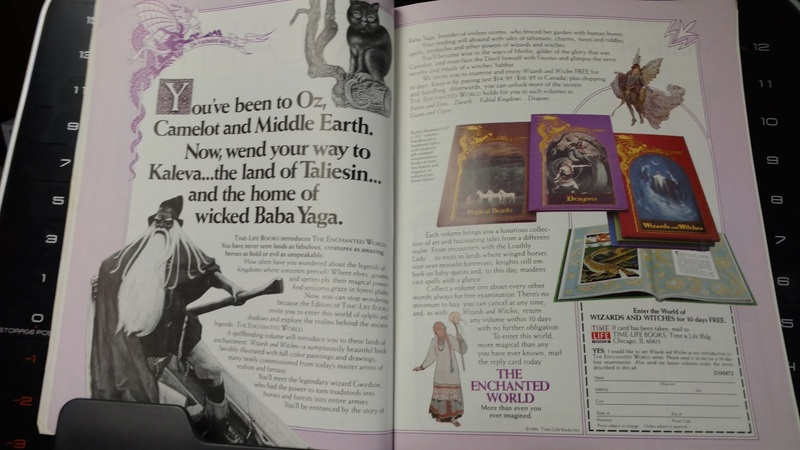 My ex and I collected nearly the entire set of Enchanted World books. Loved the art in them. She took them when we split up. I loved this issue of DRAGON, and it's up there in my top 5, easily. Mostly for the Creature Catalog monsters which got lots of play in my games (though not quite as much as those in the second one). Was also disappointed in the shields article, though a few of these did end up in my campaigns from way back when.